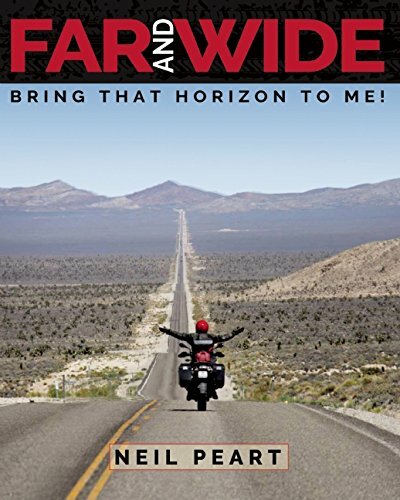 Details Emerge About Neil Peart's New Book Far and Wide: Bring that Horizon to Me! It was late last year when we first learned about a new book coming from Neil Peart. Today, new details, including an image of the book's cover, have emerged. Thirty-five concerts. 17,000 motorcycle miles. Three months. One lifetime. In May 2015, the veteran Canadian rock trio Rush embarked on their fortieth anniversary tour, R40. For the band and their fans, R40 was a celebration and, perhaps, a farewell. But for Neil Peart, each tour is more than just a string of concerts, it’s an opportunity to explore backroads near and far on his BMW motorcycle. So if this was to be the last tour and the last great adventure, he decided it would have to be the best one, onstage and off. This third volume in Peart’s illustrated travel series shares all-new tales that transport the reader across North America and through memories of fifty years of playing drums. From the scenic grandeur of the American West to a peaceful lake in Quebec’s Laurentian Mountains to the mean streets of Midtown Los Angeles, each story is shared in an intimate narrative voice that has won the hearts of many readers. Richly illustrated, thoughtful, and ever-engaging, Far and Wide is an elegant scrapbook of people and places, music and laughter, from a fascinating road — and a remarkable life. Neil's latest book is set to be released on September 13th of this year. You can pre-order it via Amazon at this LINK. I agree. Long gone are the days like 1975. Two killer albums in one year. They toured almost every year and complained about it. Get in the studio then and get that music out there. Yeesh, isn't that less of a toll on the body. Make a huge epic triple deluxe album. Don't worry if it doesn't compare to Clockwork Angels. Enough compilations. Man you even have live compilation albums who even does that. I'm a huge Rush fan, seen them 11 times, but nothing would please me more than new music. The way the band morphs and evolves I would be happy to hear anything they put out. Its always quality with Rush. The only thing holding you guys back. FEAR. Just do it. Rock something new! "Make new music"? " Save the books for later"? Give Neil a break, Do any of you realize what kind of a commitment it takes to put a normal album together, let alone a "Triple Deluxe" compilation like you are asking for? Months and months of sitting behind a drum kit, practicing and practicing to get the right feel and sound, then the months of recording sessions? The amount of pain he has endured over the past several years is what has forced him into retirement. Let him spend some time with his child and his wife. If we're lucky, maybe in a few years he'll FC eel up to sitting down and writing music lyrics. Until then, I will be on the waiting list for his new books.